February ended very warm and dry overall. It marked the eighth month of the past nine in which the average temperature ranked in the top 10 for that month. 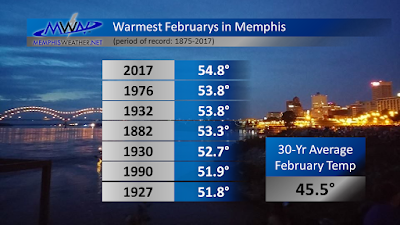 In fact, February was the second of those eight months that ranked warmest on record, averaging 54.8°, or a full degree warmer than the previous record set in 1976. 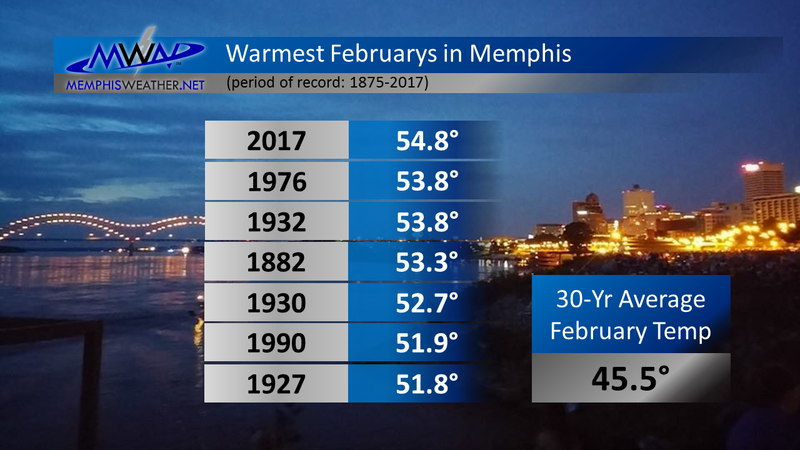 High temperatures averaged over 10° above normal and included seven days that reached 75°, a record number for the month of February. Only 5 days had average temperatures that were below normal. Precipitation was well below normal, totaling only 1.40" for the month with no snow, despite measurable precipitation occurring on twelve days. Severe Thunderstorm Warnings were issued early in the morning on March 7, but there were no reports of actual severe weather for the month despite thunderstorms occurring on a couple of days. Records set or tied: Daily record high temperatures were set on the 6th (73°, ties record), 7th (79°), 11th (79°), 19th (77°), and 22nd (76°). Records were also set for warmest minimum temperature on the 7th (60°) and 11th (63°). Comments: The average temperature of 54.8 degrees marks the warmest February on record. Five days recorded sub-freezing low temperatures, which is 4.5 below the long-term average. In addition, seven days recorded high temperatures at or above 75 degrees, which is the most on record in February.